While this was the most successful escape attempt to involve a body of water since last year’s Swedish-crown-jewels caper (see “Speedboat Escape Is Exception That Proves the Rule” (Aug. 3, 2018)), ultimately it too was a failure. So we must add it to the ever-growing body of evidence that escape attempts might as well be called off once one reaches a shoreline. Still, some credit is due to the 57-year-old fugitive who was caught this week trying to flee Australia on a jet ski. At this point your first question is probably: had this man looked at a map? Because Australia is (depending on your point of view) either a giant island or a small continent, and like pretty much everything else in those categories it’s surrounded by a lot of water. 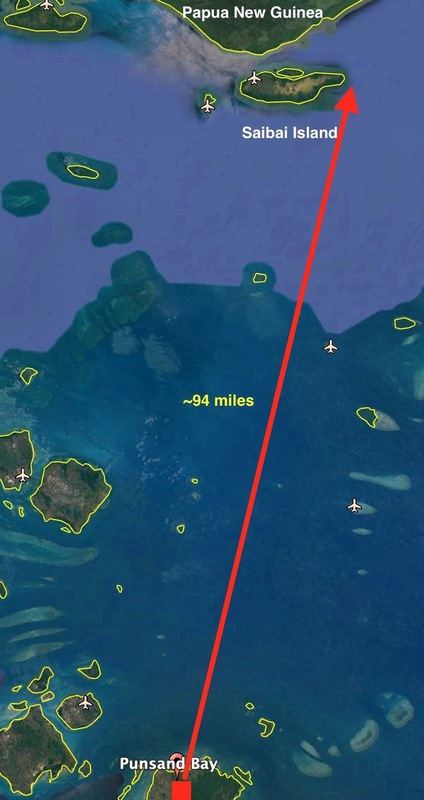 But yes, he had looked at a map, because he chose pretty much the only remotely possible option for one wanting to flee Australia by jet ski: north across the Torres Strait between the Cape York Peninsula and Papua New Guinea. That’s nearly 100 miles of open ocean. This is potentially doable, though, based on the fact that he was caught just six miles short of his destination. According to the Brisbane Times, on Monday someone reported a man launching a jet ski from Punsand Bay, near the tip of Cape York (right). It’s not entirely clear why that warranted a report, but probably because someone noticed the jet ski was loaded down with extra gas and the driver was armed with a crossbow. I guess that would tend to suggest a guy is up to something. On the other hand, there was a warrant out for the man’s arrest on drug charges, so maybe the observer knew about that. In any event, the report was made, and the chase was on. It’s probably just coincidence, but these things seem to be escalating as time goes on. A category that started with guys just standing in ponds or maybe trying to flee across a lake in a pedal boat now includes a 94-mile-long sea chase in hot pursuit of a guy armed with a crossbow. If this is escalating, I look forward to seeing where it goes next.